These are delicious. My daughters all love them, and we found out accidentally when my 10 year old tried to make a batch that even if you mix everything together (rather than following the directions) they’re still delicious. They’ll look disgusting, but they’re still delicious. She was still proud to take one to lunch, as seen in this Turkey lunch. There are a couple made properly in this Snowflake Lunch. Preheat oven to 350F. Line muffin tins with paper cupcake liners for 15-18 individual cheesecakes. In a food processor, crush cookies, and mix with butter. 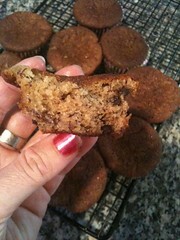 Add a spoonful of cookie crumbs to each cupcake liner, and pat down. In a stand mixer, cream the cream cheese and the sugar together. Add vanilla, then add eggs, one at a time, and continue to mix until light and fluffy. Fold in the chocolate chips at the end. 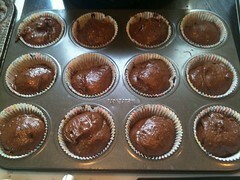 Using a cookie scoop or ice cream scoop, fill each cupcake liner with mixture. Depending on how fluffy the cream cheese mixture becomes, you will fill 12-15 cupcake liners. Bake for 20-25 minutes. Most ovens will require only 20 minutes, but some ovens are slower than others. 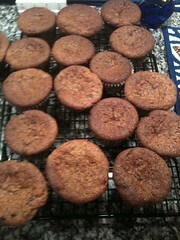 The tops should be puffy and starting to turn golden brown on the edges, but not moist. 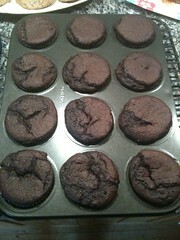 After they cool, refrigerate. If desired, top with a molded piece of chocolate. Or not – I just happened to have made star-shaped chocolates before I made the cheesecakes. I’ve been reading everything Rachael at Tales of a Monkey, a Bit, and a Bean writes, and love her attitude. I’ve been wanting to make her Hot Fudge Pie. I haven’t had a good excuse to make it. Thanksgiving turned into that excuse – I have a certain child who dislikes all fruit pies, and two children who don’t like pecan. So, of course, I made apple, cherry, and hot fudge. My mom makes a divine Kahlua chocolate chip pecan pie, so I ate that, too. No pumpkin pie – none of the gluten-free folks really seem to love that. I only had to tweak a few things in this recipe to make it gf, which made it much easier. A special hat tip to this recipe – my niece and nephews dislike anything they realize is gluten-free. Plus, 2 don’t like pie. 3/4 of them ate this and loved it, including one who doesn’t like pie. Despite there being 4 gf pies and 4 “regular” pies, we had less than half of this very rich chocolate pie left. This is a delicious gfcf, gluten free, family-friendly recipe! It can also be (if you double check ingredients!) a wheat free, dairy free, soy free,tree nut free, peanut free, fish free, shellfish free, corn free, and vegetarian recipe. To make the crust, first pulverize the graham crackers in a food processor. Next, melt the butter in the microwave. In a large bowl, combine butter, cracker crumbs, and sugar. It will barely hold together. Spray a glass 9″ pie plate with cooking spray (I like Trader Joe’s Coconut Oil Spray). Pat the graham cracker mixture into the pie plate and refrigerate for an hour (or more). Whisk sugar into the butter/chocolate mixture, then whisk in the flour, salt, and vanilla. In a smaller bowl, beat eggs. Whisk the eggs into the chocolate mixture. Pour the chocolate mixture into the graham cracker crust. Bake at 350 for 20-30 minutes. When a toothpick is inserted into the center of the pie, it will still be moist when it’s done cooking. Allow to cool, then serve with homemade whipped cream. Watch out – this is very rich – cut thin slices! Angel Pie was my default birthday “cake” growing up. My much-beloved Nana R (my dad’s mom) made this for every birthday and holiday. She said a lot of recipes were “tricky” (which meant she didn’t want to try them), but this recipe always felt tricky to me until I got her exact recipe. Now my middle daughter makes it a lot, and so do I. It’s so wonderful to have these food-based memories of my grandmother I can share with my daughters! The main trick is not to make Angel Pie when there’s high humidity – that makes meringues sticky. This is a delicious gluten free, family-friendly recipe! It can also be (if you double check ingredients!) a wheat free, soy free, tree nut free, peanut free, fish free, shellfish free, and vegetarian recipe. Preheat oven to 300F. Grease a glass pie plate (ideally deep dish) and dust with a bit of rice flour. I really like Trader Joe’s coconut oil spray for greasing, but any spray or a bit of butter or coconut oil works well, too. Beat egg whites, ideally with a stand mixer, but a hand mixer can also work, though it will take longer. After the mixture becomes opaque, slowly add the granulated sugar , then the confectioner’s sugar, all while beating constantly. Continue to beat until stiff peaks form. Mixture must be beaten and glossy. Spread onto the pie plate. Bake at 300F for 1 hour. The meringue should become lightly browned and be hard when touched. Allow the meringue to cool completely to room temperature. Once the meringue has cooled, make the topping. Whip the heavy cream in your stand mixer (or hand mixer). As it’s whipping, add vanilla and sugar. Beat until stiff peaks form. Spread the whipped cream onto the meringue. Using a microplane grater, grate chocolate over the top of the pie. A heavy dusting of chocolate is preferred. Refrigerate for at least 4 hours, ideally overnight, before serving. This is a deliciously light dessert, one you will always have space for, even after a big meal! Yum! This is an amazing chocolate cake recipe, with a deep chocolate flavor. 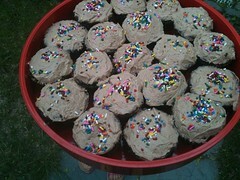 These are some of the best cupcakes/cakes I’ve ever had. This has become my go-to cake recipe, and as a bonus, when I’ve served these to people without allergies, they gobbled them up without realizing they were “special”. This is a great example of serving great food, not just food that’s good for people with Celiac and/or allergies. This makes 2 dozen cupcakes or 2 9″ round cakes. Lightly grease the bottom of the baking pans, then dust with a little cocoa powder, or line 2 muffin tins with cupcake liners. Whisk the three flours together. Add cocoa, xanthan gum, baking powder, and baking soda to the flours and whisk together in a medium bowl. In a separate bowl, with your mixer, beat the butter until creamy. Slowly add the brown sugar and the granulated sugar. Whip this mixture until fluffy. Add the eggs one at a time to the creamed mixture, then add the vanilla. Turn the mixer to low and alternate adding the flour mixture and the buttermilk. Pour into the prepared pans – if making cupcakes, use an ice cream scoop to measure an equal amount of batter into each cupcake liner. For cakes, bake for 25-30 minutes; for cupcakes 12-15 minutes, until the cake/cup cake is springy to the touch and a toothpick comes out clean. Let cool, then serve as is or frost with a “butter”cream or faux-cream cheese frosting. Yum!